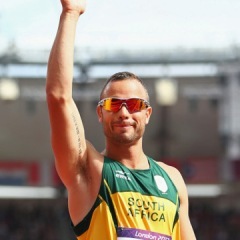 London - "Blade Runner" Oscar Pistorius on Saturday brought the Paralympic track and field programme to a close in style, winning his favoured event by a huge margin in a new world record time. Victory for the 25-year-old South African never looked in any doubt from the gun, as he struck out on his own to lead coming into the last half-lap and was roared across the line by the packed 80,000-capacity Olympic Stadium in 46.68sec. US athletes Blake Leeper took silver in 50.14sec with David Prince in bronze on 50.61. Pistorius -- the only man in the field to run under 50sec for the one-lap sprint and the first double-amputee to compete at the Olympics last month -- won the 100m, 200m and 400m treble in Beijing four years ago. But he lost both of the shorter sprint titles to Britain's Jonnie Peacock and Alan Oliveira of Brazil.